Right off the bat her two year old was 100% not interested in anything having to do with photos. So we decided to let him play while we proceeded with the twins’ baby photo session. 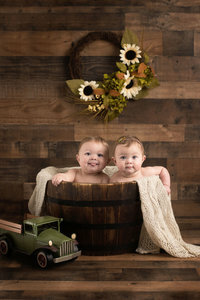 As can be expected of seven month olds, they were full of smiles, drool, and curiosity. Whenever the twins were close, they would grab each other’s feet, spontaneously link arms, hold hands, or touch each other’s faces. The movements of their hands, and their expressions even seemed to mirror each other sometimes. While pregnant, Nicole found these little braided identifying bracelets on Etsy to allay her fears of mixing them up. One with colors of green, and the other with colors of blue. She said that she even dresses them in coordinating colors whenever possible. Despite her early fears, she has always been able to tell them apart easily. She still likes to use the bracelets to be certain, but I am wondering if that is more for the rest of us, because I certainly could not tell them apart! If you are curious, check out this article for more info on identical twins. In some ways she is looking forward to the time when one of them develops a distinguishing mark so that it will be easy for everyone. As mommies of toddlers, we both know that inevitably the scars or birthmarks will appear. Nicole was kept on her toes with this lap full of babies. “You must have your hands full? !”, is a phrase she laments is often voiced by strangers on the street. I am convinced that people are saying this only looking for confirmation, because she certainly made juggling them look remarkably easy. Nicole cleverly coaxed cooperation from her toddler as well! She told him that the tractors that he had been playing with needed gas, but that their gas station was in the studio. He was rightly skeptical about the location of the tractor gas station being in the studio, and not actually in the playroom with all the other toys. But she seemed so certain, so he decided to play along. Once in the studio Nicole got down on the rug and drove tractors with him, showing him how much fun it was to drive tractors on the shaggy rug. He embraced this idea for only a short time, but it was long enough for me to snap some pictures of him as he played.